Last week we talked about setting Family Resolutions this year. Setting goals and resolutions together as a family will help strengthen our family relationships. Although we need to set our own individual family resolutions, there are three resolutions that EVERY FAMILY should implement every year. 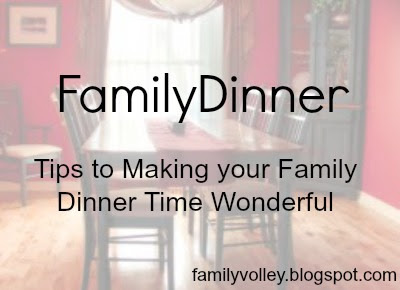 Today we are talking about Must Have Resolution #1-Family Dinners. Lets start with some facts and figures. Did you know that good research suggests that Family Meals, specifically dinner, is THE most important thing parents can do for their children? THE most important. As parents, it is natural for us to think that we need to provide our children with lots of "other" experiences or opportunities to help them learn and grow. But, fact of the matter is, mealtime is more important than time spend in sports, school, studying, or in extra curricular activities. For children, regular family dinners (5-7 times a week) means better grades in school and better behavior. When there is discussions during family dinner, it has a greater affect on our children's development and vocabulary skills than playing with toys and reading them books. The research is solid and overwhelming. If you are wondering what you can do to make your family stronger, start by making sure you are intentional about family dinners. Easier said than done, right. I know what you are thinking. "We are busy, there is so much going on." "The kids never sit still or eat their food." Here are a few suggestions to make dinner time better and more manageable. First, get everyone on board. Sit down as a family and talk about how you are going to eat together each night. Make it clear that everyone is expected to be there. Work through schedules and complaints, but don't give in. This is important. Also, make it clear that you are turning off the tv during dinner, and that cell phones are not allowed at the table. This goes for parents also. A fun way to handle technology? When everyone sits down to eat, pass around a small basket or bucket and have everyone deposit their electronics in the basket. Once dinner is over, they can retrieve their goods from the basket. Second, have a meal plan. This might sound trivial, but it is a big deal. Planning ahead, so you know what you are going to eat, saves time and makes you less stressed. Sit down and plan out the next two weeks. Have your calendar on hand so you know what nights are extra busy and plan your meals accordingly. When I was first married, with only one child, a meal plan wasn't quite as vital. But now with a full house and everyone involved, a plan is vital. Plus, meal plans save money. Added bonus. Then, be sure you have a way for everyone to know that dinner is starting. Maybe you ring a bell. Maybe you set a time, 6 o'clock every night. Maybe dinner is when dad gets home from work. When he comes in, everyone heads to the table to eat. Regardless, come up with a way for the whole family to know it is time to eat. Why does this matter? It puts us all on the same page. We know what to expect. That is important. Next, focus on what you want to have happen while you are eating. Do you want to talk while you eat? Of course you do! What are you going to talk about? Think about these things before you sit down. Will you talk about what happened at school? Will you play a game and have each person tell two truths and one lie? Will you have a jar full of discussion prompts and have a different person pull out a prompt each night to discuss? It doesn't matter how you go about the discussion, just talk. Let everyone participate and be involved. Remember, dinner conversation is not a time to argue, or discuss hard things like finances, or a time to scold or reprimand the kids. If every time you sit to eat, your kids get interrogated and reprimanded, they will not want come back to family dinner. It is natural that as adults, we might expect to be able to use this time to talk to our spouse. But this is not the time for personal one-on-one spousal conversations. The focus should be the family and involving your children. You can find time for the two of you to talk later. Finally, you need to settle on an exit. How will your family know that dinner is over? Why is this important? Let me give you an example. Our family learned this the hard way. In our family, we eat at different speeds. My husband eats really fast, and so does our daughter. They finish and are ready to move on to something else. I am always the last to finish because I have been helping everyone else and feeding small babies. Our son eats very slow, while he tells us a million things about his day. Mingled with fun facts and findings that he has been waiting to share. So... I found that we were never really eating together because my hubby and daughter were off and running while a few of us still sat to finish. Seeing them off doing other things made the other kids want to forget about dinner and go play too. The whole thing turned into a disconnected mess. So... this is why you need an exit. Now, we all sit at the table and talk until EVERYONE is finished eating. Every once in a while there is an exception. There will be exceptions. But for the most part, we all now sit together until everyone is done and then the kids ask if they can get up. Once they get the go ahead, they take their plates to the sink, the older kids put their dishes in the dishwasher, and then they can leave the kitchen. Having a start, middle and end to our dinners keeps everyone on the same page. It eliminates confusion and makes for a much more meaningful and peaceful experience. I can promise that if you will work to eat together, and establish these three phases (beginning, middle, and end) that your dinners will be more successful and your family will grow closer together. Don't get discouraged. Not every dinner will be perfect. Kids won't always eat their vegetables or sit in their seats, but don't quit. It is too important. If there is no way you can eat dinner together. Try to eat breakfast or lunch together. Remember, 5 is the magic number. Eat together 5 or more days a week! Do you eat dinner together as a family? How often do you and your family eat together? We struggled with family dinners because my fiance and I both work and his daughter only spends a few days with us. But we purchased family dinner games (they have a website) and now she begs to have sit down family dinners! So fun! My husband and I will be rolling out this plan for our family tomorrow night. I want to call everyone together with a song on the stereo. Any ideas for a fun one? ?